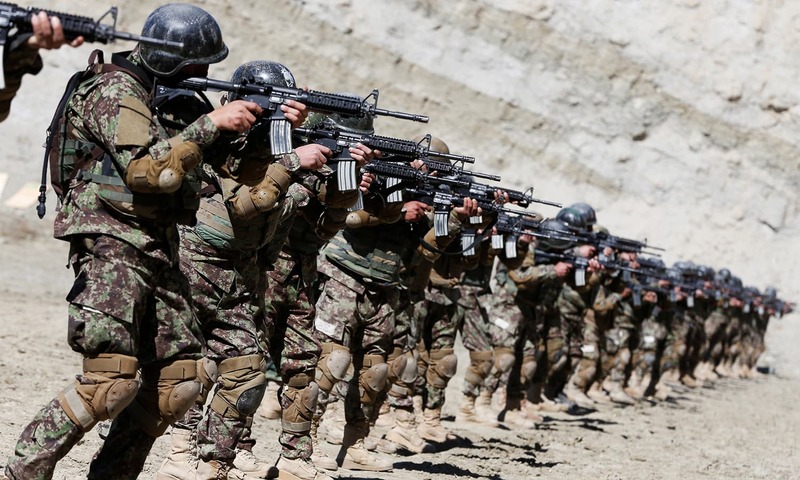 Afghanistan -- International pressure for a cease-fire in Afghanistan grew Tuesday, but there was no sign on the ground of the two sides suspending their battle for the plains north of the capital Kabul. The United Nations Security Council was expected to adopt a resolution calling for a cease-fire and political negotiations on Tuesday, while its envoy Norbert Holl continued his efforts to get the warring factions to agree. But in this village 14 miles north of Kabul, Taleban fighters, who took the capital last month, poured rockets into positions held by former government military chief Ahmad Shah Masood to the north and in villages to the west. There was also sporadic incoming fire from Masood positions. Masood's forces fought their way forward Tuesday toward the strategic Khair Khana pass on the main road into Kabul. ``We control the west side of the pass,'' Sabir, one of Masood's commanders in Hussein Kot, told reporters. Shellfire raised columns of dust on the hills around Khair Khana, while heavy machinegun fire echoed around the mountains. ``We have orders to move forward and take the pass,'' said Sabir, in an apparent reference to calls from the two sides on Monday for a conditional cease-fire. Doubt about where the front line is on maps has led to confusion over whether the village of Hussein Kot was in Masood's or Taleban hands. Some locals said the name applied to a string of villages along the road, parts of which may be held by each side. Refugees continued to escape to Kabul, some forcing an overloaded truck on the main road to stop and clambering aboard in a near panic. One woman later fell off. On the road just beyond Sabir's mud-walled command post on the Masood side of the frontline, the charred carcass of a Merecedes bus burned after it was hit by a rocket earlier on Tuesday morning. ``Two boys were badly wounded,'' said Mahmud Hojon, a doctor at a crumbling field hospital in the village. He said other passengers had managed to escape the bus when a rocket landed earlier nearby. Hojon said fighting overnight had wounded 12 people, mostly civilians, who had already been evacuated. Taleban fighters reiterated claims they had pushed Masood forces further back up this main road across the northern plains, and said they had captured 150 prisoners. It was not immediately possible to confirm the claims. Masood, formally allied to northern Uzbek chief Abdul Rashid Dostum, has in the past 10 days reversed a Taleban offensive on his Panjsher stronghold and taken positions within rocket range of the city, including Bagram military airbase. The Taleban, reinforced by an influx of fighters from other provinces, have stopped the advance within 30 minutes' drive of the capital. Fighting has since been confined to a swathe of dusty plain and hilltops some 20 miles wide. The planned U.N. resolution, drafted by Russia, calls for states to refrain from interfering in the conflict and stop supplying arms to factions. It also calls on U.N. Secretary-General Boutros Boutros-Ghali and his envoys to cooperate with interested states and organizations to promote a political dialogue. Pakistan, which has denied accusations it is backing the Taleban, has made some headway in brokering a cease-fire, with both the Taleban and Masood saying Monday they would halt fighting under certain conditions. The Taleban have demanded an exchange of prisoners while Masood earlier called for the demilitarisation of Kabul. But the initiative, led by Pakistan Interior Minister Naseerullah Babar, appeared to founder late Monday when Masood spokesman Dr Abdullah said continued shelling by the Taleban had scuttled calls for a cease-fire. It was not immediately clear whether the statement was Masood's final word on the matter. Afghan watchers say Pakistan's efforts are hamstrung by suspicion that it is partisan and seeking to isolate Masood by reaching an understanding with his newfound ally Dostum. U.N. envoy Holl, who was due to visit Dostum's northern stronghold of Mazar-i-Sharif Tuesday, said Monday he welcomed the Pakistan initiative but warned no single country could bring peace to Afghanistan.